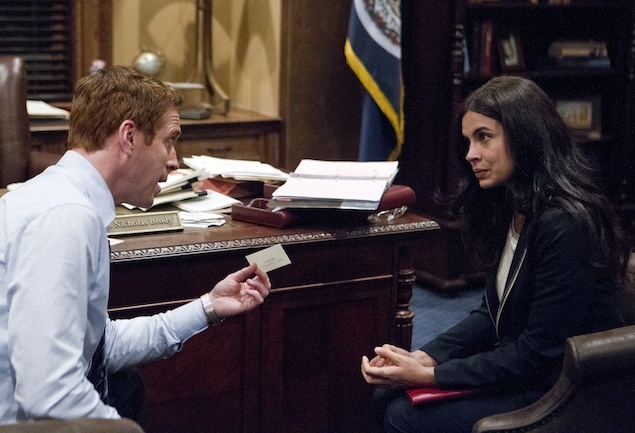 Carrie and Brody are both called out of retirement in the most eagerly awaited season opener since someone shot JR.
Damian Lewis as Nick Brody and Zuleikha Robinson as Roya in Homeland. Photograph by Kent Smith/Showtime. Homeland” quite like you can. asset blew up five of his agents, Saul is pretty convinced it’s a risk worth taking. brother, the fox, and gives nothing away. He was in a Taliban hold for eight years! wants nothing to do with him. kid says, “Yeah, and mine’s a Scientologist,” and everyone laughs because it’s hilarious. that is, and hopefully we’ll find out at some point. mother is yelling at her over and over again for telling everyone her father’s a Muslim. to stop all the haranguing. way, but Saul is no slouch and spots the same sinister men from earlier watching him. 1) Who is the mole? I’m going to ask this every week until we find out. 2) Is VP Walden as much of a moron as he seems? but they can build an entire Lebanese market from scratch? 5) Carrie’s a vegetarian now? And we’re supposed to care about that why?